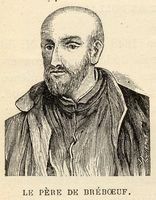 LALEMANT, JÉRÔME (called Achiendassé by the Hurons), Jesuit priest, superior of the Huron mission (1638–45), superior of the Jesuits in Canada (1645–50 and 1659–65); b. 27 April 1593 in Paris; d. 26 January 1673 at Quebec; brother of Charles and uncle of Gabriel Lalemant. 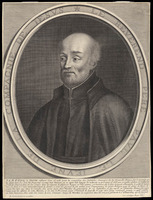 Jérôme Lalemant entered the Jesuit noviciate in Paris 20 Oct. 1610; he studied philosophy at Pont-à-Mousson (1612–15) and theology at the Collège de Clermont (1619–23). In the interval he had been prefect of the boarding-school at Verdun (1615–16) and teacher at the Collège in Amiens (1616–19); after finishing his theology he taught philosophy and the sciences at the Collège de Clermont (1623–26), and did his third probationary year at Rouen (1626–27); then he became minister of the Collège de Clermont (1627–29) and principal of the boarding-school of this same college (1629–32), rector of the Collège in Blois (1632–36); from 1636 to 1638 he was again at the Collège de Clermont, this time as spiritual adviser. Few Jesuits had had as wide experience as Father Jérôme Lalemant before coming to Canada, an evidence of the high esteem in which he was held by his superiors. It is not astonishing, in view of this, that he was named superior of the Huron Mission in 1638, the very year of his arrival in the country. He succeeded Jean de Brébeuf. His first act was to make a count of the population living within the Huron country: 12,000 people divided among 32 towns or villages. His name remains associated with the central residence of the missionaries in the field: Sainte-Marie-des-Hurons. Begun in 1639, this first important establishment west of Quebec developed at the same pace as the mission. It comprised in 1649 a chapel, the fathers’ residence, that of the lay personnel, carpentry and iron working shops, a hospital, a retreat house for the neophytes, guest quarters for the non-Christians who were passing through, a cemetery, a farm with a poultry-yard and farm animals. A base for apostolic operations, Sainte-Marie-des-Hurons was, from 1639 to 1649, and in every sense of the word, the stronghold of the mission. This prominent place in Canadian religious history deserved a better fate than the oblivion which was its lot for two centuries. 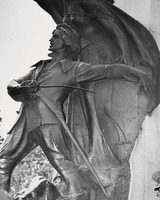 By collaborating to restore it to life in the 1960’s, the Jesuits of the district of Upper Canada and the archaeologists Kidd and Jury are enabling us to have a better understanding of the greatness of soul of those Frenchmen of the 17th century and of the gigantic tasks which they took upon themselves in order to implant Christian civilization in the very midst of barbarousness and to carry it ever forward. The material realization of Sainte-Marie-des-Hurons would have been impossible without an institution introduced into Canada by Father Jérôme Lalemant: the donnés (“given men”). The lay brothers, who were responsible for the domestic tasks, were too few to be able to keep up with the constant development of the mission. Moreover, their status as religious forbade them to carry arms; yet it was not prudent for the missionaries to remain defenceless in the Huron country. The donnés, who dedicated their lives to the mission but without taking vows of religion, assisted the lay brothers and could in case of need take up arms. It would be difficult to exaggerate their importance in the development of the mission. Thus, to take just one example, in 1649 there were in the Huron country 16 fathers, 4 lay brothers, and 22 donnés. In 1644 Father Jérôme Lalemant was appointed superior of the Jesuits in Canada with his residence at Quebec. As the mail bringing him this news had been intercepted by the Iroquois, he did not take up his post until September 1645. This first period of office (1645–50) had very great trials in store for him. 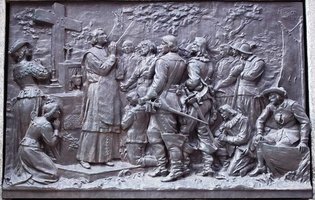 It was during this time that the martyrdom occurred of Isaac Jogues, Antoine Daniel, Jean de Brébeuf, Gabriel Lalemant, Charles Garnier, Noël Chabanel, and Jean de La Lande. We must add also the devastation of the Huron mission, which he had organized and administered so well. He was deeply affected by these events, but he was too submissive to God’s will to be depressed by them. It was a great consolation for him to be able, in the summer of 1650, to venerate the remains of Brébeuf and of his own nephew Gabriel, which had just been brought to Quebec. In the autumn of that year he sailed for France, in order to plead there the cause of the Canadian missions. 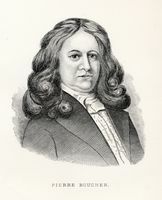 When he returned in 1651 he obeyed his successor, Father Paul Ragueneau, as simply as a novice. In 1656 he was recalled to France, and two years later he was named rector of the Collège royal de La Flèche. At the pressing request of Bishop François de Laval*, who had shortly before been appointed apostolic vicar of New France, Father Lalemant returned to Quebec as superior of the Jesuits in 1659. He was received enthusiastically by his fellow religious; and this was the starting-point of a second glorious period for the Society’s missions in Canada. A man of infinite discretion, he was able in the difficulties which were at that time disturbing Canada to retain the esteem of Bishop Laval and the confidence of the governors of the colony. He was the spiritual adviser of Marie de l’Incarnation [see Guyart], who frequently praises him in her letters. She wrote to her son on 30 Oct. 1650: “He is the father of the poor, French as well as Indians: he is the ardent servant of the Church who seems to have been brought up in all the ceremonies, which is not usual for a Jesuit. 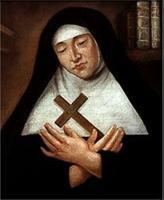 Lastly, he is the most saintly man I have known since I was born.” It was he who in 1646 had drawn up the Constitutions of the Ursulines of Quebec. It was under Father Jérôme Lalemant’s administration that Huron families were settled on the Jesuit lands at Beauport. We are indebted to Father Jérôme Lalemant for the Relations concerning the Hurons for the years 1639 to 1644. To him are also attributed those which were published during his two periods of office at Quebec. A manuscript by Father Félix Martin, which is preserved in the archives of the seminary of Quebec, informs us that Father Lalemant “is said to have put the finishing touches to a Huron catechism in which he had brought together the principal truths of religion.” Research workers are grateful to him for his immense contribution to what has survived of the Journal des Jésuites. These entries, made from day to day concerning the events, great or small, connected with the history of the colony, are the necessary complement to the Relations; they take us more deeply into the social, political, and religious life of Canada at that time. The Hurons had named Father Lalemant “Achiendassé.” He has himself recounted for us the origins of this custom: “The reason for these surnames arises from the fact that the Savages, not being ordinarily able to pronounce either our names or our surnames – as they do not have in their language several consonants that are found therein – get as near to them as they can; but if they cannot succeed, they seek instead words used in their own country, which they can readily pronounce, and which have some connection either with our names or with their meaning. But inasmuch as it sometimes happens that they make rather unsuitable guesses, the confirmation or change of names that they have given during the voyage is made when they reach home.” According to Father Simon Le Moyne, the name “Achiendassé” subsequently designated the superiors of the Jesuits of Quebec, just as that of “Onontio,” first given to Charles Huault de Montmagny, designated the governors of the colony. ASQ, MSS, 43, “Étude sur les Relations des Jésuites,” par Félix Martin. Marie Guyart de l’Incarnation, Écrits (Jamet), IV, 307; Lettres de la vénérable Mère Marie de l’Incarnation, première supérieure des Ursulines de la Nouvelle-France: divisées en deux parties, éd. Claude Martin (Paris, 1681). JR (Thwaites), passim. JJ (Laverdière et Casgrain), passim; reprinted in JR (Thwaites), XXVIIf. ... J.-O. Bégin, “Le Père Jérôme Lalement, supérieur de la mission huronne: étude critique sur la valeur historique des Relations des Hurons (1639–1644),” thèse de maîtrise présenté à l’Institut d’Histoire de l’Université de Montréal, 1952. Campbell, Pioneer priests, II, 279–324.. ... For more detailed information on Sainte-Marie-des-Hurons, consult the following: Jean Côté, “Domestique séculier d’habit, mais religieux de cœur “ RHAF, X (1956–57), 183–90, 448–53 (bibliography)., “L’institution des donnés,” RHAF, XV (1961–62), 344–78. Wilfrid Jury and Elsie McLeod Jury, Sainte-Marie among the Hurons (Toronto, 1954). Kenneth E. Kidd, The excavation of Ste Marie I (Toronto, 1949). Rochemonteix, Les Jésuites et la Nouvelle-France au XVIIe siècle, I, II..
Léon Pouliot, “LALEMANT, JÉRÔME,” in Dictionary of Canadian Biography, vol. 1, University of Toronto/Université Laval, 2003–, accessed April 19, 2019, http://www.biographi.ca/en/bio/lalemant_jerome_1E.html.